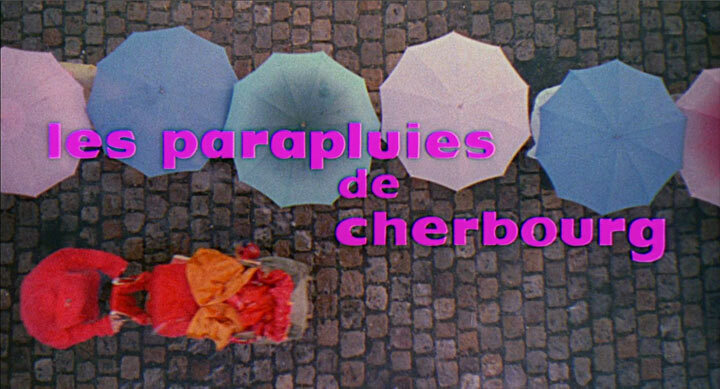 Next to the main titles for The Young Girls of Rochefort, the body of work of French title designer Jean Fouchet contains another masterpiece – the title sequence of the bittersweet musical drama "Les parapluies de Cherbourg." Shot in one single take and supported by the famous score by multiple Academy Award-winning composer Michel Legrand, director Jacques Demy and Fouchet created their most memorable title sequence together – one that appears on numerous lists of favorite film credits of all time. In spite of the sumptuousness of all that follows, I love the opening title sequence most of all [...] The rain falls vertically, the meticulously choreographed pastel umbrellas and bicycles move across the screen, and the heart is automatically enraptured by the impeccable care and attention paid to the film’s colour and surface and style. 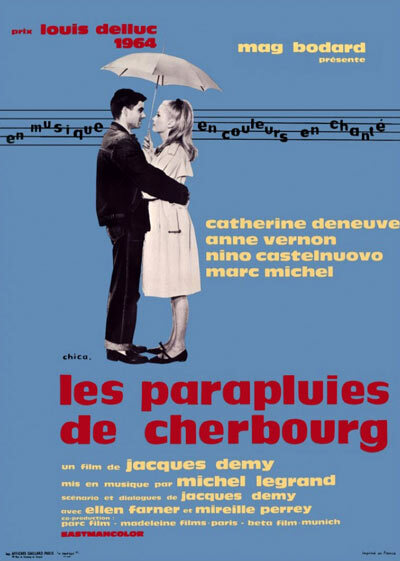 A classic of the New Wave cinema, Les Parapluies de Cherbourg is a visually abundant, romantic musical drama set in the 1950's in the French coastal town of Cherbourg. The film's story about love and loss is told in three acts. The first act deals with Geneviève, a 17-year-old girl played by Catherine Deneuve who works in her mother's umbrella shop. She is madly in love with Guy, a car mechanic. The couple decides to get married, but their young romance ends abruptly when Guy is drafted into the Algerian War for two long years. In the 1960's France was having a hard time leaving behind its colonial past. Demy makes a subtle hint at this by setting the opening scene at a naval military base similar to the one in “Les Demoiselles de Rochefort.” It also points to another recurring theme in the director's films, the aspirations of youth faced with the dramatic worlds of adults. The significance of the﻿ umbrellas throughout the story shows how most people seek safety when in doubt, instead of allowing natural elements and chance to follow its uncertain path. By seeking safety, they sometimes lose the things that they want most. "Les Parapluies" is an homage to the great Hollywood musicals. The references to Stanley Donnen's famous film "Singing in the Rain" are obvious. Notice for instance the similarities in the way the camera pans up and down, and stops on the cobblestones that pave the wharf. Fouchet cleverly uses the pattern of the stones as a grid that informs the layout of the typography. And Demy's inimitable choreography and its pastel umbrellas evokes the natural ballet of young couples and passersby seeking shelter from a rainstorm. 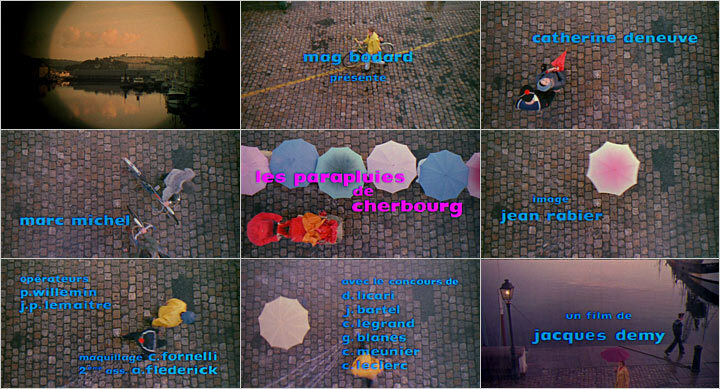 The title sequences for “Les Parapluies” represents the quintessence of French talent of the era and mark the beginning of the successful collaboration between Demy, Fouchet and composor Michel Legrand. These opening titles do not credit the title designer, but according to his wife Jacqueline, who we interviewed recently, Fouchet collaborated closely with Demy and Legrand on the production of these two landmark French title sequences. Beautifully crafted in terms of emotional pull and visual symmetry. It tells you everything about the film in a few minutes. Text: Hervé Tissot, © Submarine Channel April 6, 2012. Jean Fouchet was born in France in 1918. He graduated in graphic arts and began working in the film industry as a set designer, decorator, assistant operator. In 1950 he was hired by the Lax company to handle special effects and credits. Shortly thereafter, he founded his own company, F.L. He started creating title sequences, trailers and special effects. Among others, he made the special effects for the film The Longest Day in 1962. The last film he worked on was The Tenant by Roman Polanski in 1976. With Agnes Varda on the restoration of "Les Parapluies de Cherbourg"